The Vail Recreation District and Vail Chamber & Business Association will host the sixth annual Businesses, Bogeys and Bragging Rights Community Golf Tournament on Thursday, Sept. 5 at the Vail Golf Club to benefit the VRD's Tom Slaughter Jr. Memorial Youth Recreation Grant. Teams, sponsors and silent auction donations are being sought - don't miss out on the best event of the season! The grant program, a memorial to Vail Valley resident Tom Slaughter, Jr. who enjoyed endless recreational opportunities in the valley, is used to award funds to school-aged children who are in need of financial support to participate in VRD youth programs. The VRD is partnering with the VCBA for the tournament as an opportunity to bring the community together for a social and spirited day of golf, celebrate a successful summer and contribute to the development of the Vail Valley's youth. The Tom Slaughter, Jr. Memorial Grant Program began in 1997 and provides youth with opportunities to participate in VRD day and sport camps, gymnastics, golf, basketball and other programs in Vail. Each year, the VRD awards approximately $20,000 in cash and in-kind services to children in Eagle County through its Eagle County Youth Activities Grant and the Tom Slaughter, Jr. Memorial Grant programs. These programs have helped hundreds of local youth get outside, learn, grow and recreate. Last year's golf tournament hosted 32 teams and raised over $20,000 to be used this year and in future years. "Last year's tournament was incredibly successful and showed how the local community can come together for a great cause," said VRD Executive Director Mike Ortiz. "We pride ourselves in providing amazing learning opportunities for the young and young at heart. We're excited to partner with the VCBA for the sixth summer and offer our community an opportunity to celebrate our local children." Team registration is underway for the tournament and cost to participate is $500 per team, including cart. Participants will enjoy food and refreshments, as well as opportunities to compete based on performance, spirit and camaraderie. Mulligans will cost $5 and those who purchase mulligans will be entered into a raffle drawing for a variety of prizes donated by the community. Each golfer will receive a take-home gift. Register today to reserve your team spot as this tournament will sell out. Sponsorships are also available for businesses within the community, including green and/or tee sponsorship, presenting sponsors, raffle items and silent auction items. According to Alison Wadey, VCBA Executive Director, the event is an opportunity for Vail businesses, their employees and community members to come together and chip in for kids. "Last year's tournament brought out many businesses old and new. This event is a great way to meet and socialize with your neighbors while helping our community's youth," said Wadey. 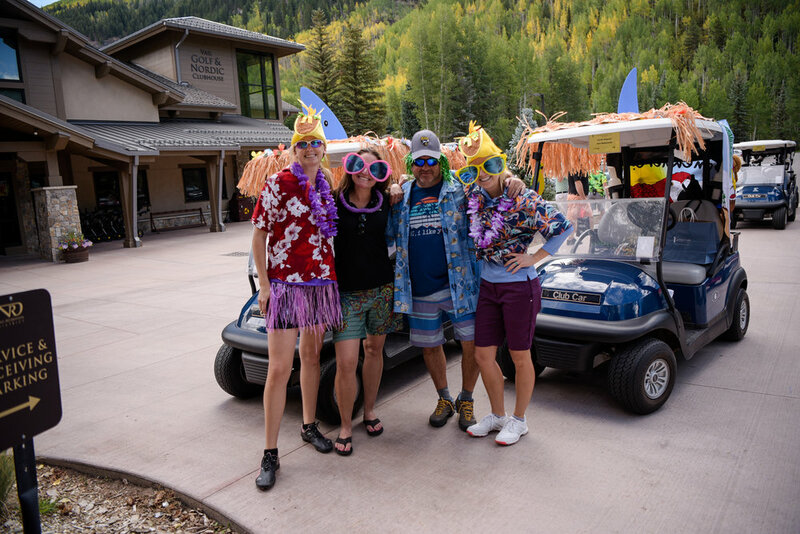 "We hope this tournament provides a fun way for our businesses, employees and community members to come together at the end of the summer to celebrate how great it is to live and do business in Vail. We hope you will join us for this fun event, with a new theme yet to be decided. Vote here to choose your favorite theme or tell us your idea! For more information on the tournament, contact Wadey at 970-477-0075 or Jessie Klehfoth, VRD Marketing and Communications Director at 970-479-2446. Click here to download registration form and sponsorship information.